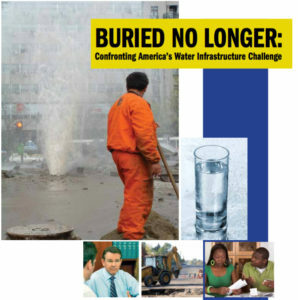 Focusing on drinking water systems, this report documents the decay of water infrastructure in communities throughout the United States. The American Water Works Association (AWWA) argues that costs will continue to increase, at more cost to consumers, and documents regional differences. AWWA estimates that $1 trillion is needed over the next 25 years in order to repair these infrastructure systems. The report argues for the development of comprehensive strategic investment plans that will help to reduce costs to consumers while addressing these drastic needs effectively, and provides a series of charts documenting the investment needs according to replacement of particular piping systems.